Some are mighty icons of bygone craft and woodsy romance. Others are tucked-away gems, perfect for a cold-weather weekend escape. We explored Oregon’s forests, coast, and high desert to find the state’s best winter lodges and retreats — and the results could keep you busy (and cozy) straight through the season. At Mount Hood’s famed Timberline, enormous stone fireplaces, crafted from boulders found slopeside during the 15 Depression-era months of the lodge’s construction, warrant their place on the National Historic Register. Far to the south, Camp Sherman’s Lake Creek Lodge offers a more low-key (and definitely family-friendly) getaway, with the main lodge’s big-screen TV, Ping-Pong, foosball, and pool table standing ready in case cabin fever sets in. Central Oregon’s Sunriver offers 300-plus days of sunshine and Fido-friendly suites and homes that have been drawing families since 1968. And alfway between somewheres (Eugene and Bend), Eagle Rock Lodge is a beautiful kind of nowhere, snuggled in a forest of cedar and maple on the banks of the McKenzie River. Ultimately, whichever great Oregon lodge pulls you, the attraction is really about soul: a place as steeped in community as it is in nature, a shelter set among the Northwest’s natural bounty—be it mountain, river, or sea—where you’ll find cozy, communal spaces for sharing stories and supper and, eventually, memories … and, of course, where you’ll also find a good fireplace. 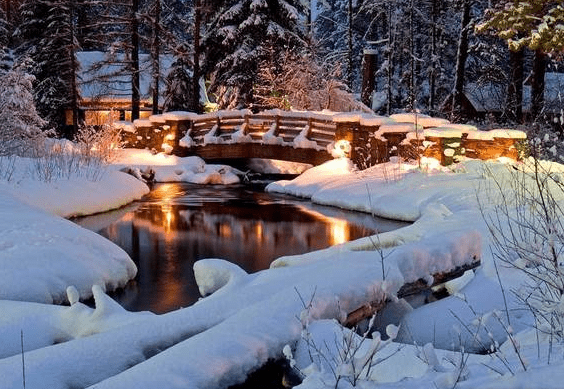 Find more cozy winter lodges at Portland Monthly Magazine where this story was first published.